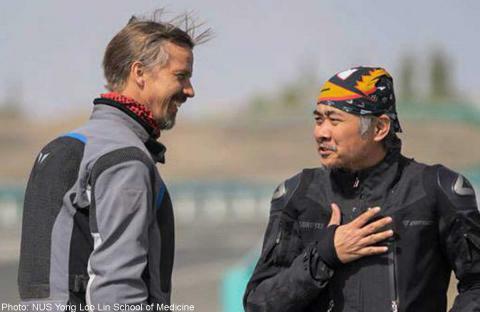 A three-month motorbike trip from Singapore to Sweden by a pair of surgeons has raised S$3 million for Asian breast cancer research. After riding through 17 countries and covering more than 23,000km, associate professors Philip Iau and Mikael Hartman have also returned with fresh insight into how women in developing Asian countries deal with the disease – and a trunkful of stories, like how they were detained in a police station in Iran. “Until now, I’m still not exactly sure what happened,” said Prof Iau on Wednesday. The pair from the National University of Singapore (NUS) Yong Loo Lin School of Medicine were also stuck for nine hours when crossing the border from Kazakhstan to Uzbekistan, a problem which Prof Hartman said was “eventually resolved with a cigarette”. The aim of the road trip, which they called The Long Ride, was to raise awareness of breast cancer issues, especially in Asia; create collaboration with professionals elsewhere; and raise funds, which will be matched by the Singapore Government one-for-one and are managed by the NUS Development Office. “We wanted to tell people, even those outside Asia, what it is like to have breast cancer in Asia. We wanted to highlight the uniquely Asian features,” said Prof Iau of the trip, which was completed last month. He explained that Asian women diagnosed with breast cancer face a higher chance of dying than women in the West, as most do not go for regular mammograms. Even after diagnosis, some drop out of breast cancer treatment halfway. On their trip, the surgeons found out – after meeting breast cancer patients in China, Malaysia and Thailand – the big worry for patients was that the cost of treatment could mean using money that could have been used for their children’s education. They were also afraid of how their husbands would view them if they had to remove a breast. Prof Hartman said that even in Singapore, the take-up rate of breast cancer screening is “substantially low”, according to his research. During the trip, the two surgeons stopped to give lectures, attend breast cancer forums and workshops, and meet other doctors and academics. In Chiang Mai, they were also the guests of honour to open the city’s first women’s cancer centre. In China, they sat in for interviews for an anthropological study on how culture affects the way the disease is viewed. In Uzbekistan, they conducted lectures at the Tashkent State Medical Institute. “What we wanted to do was to attract attention to breast cancer issues, and what we plan to do about them,” said Prof Iau.